Munich - Missing out on a goal was no tragedy for Thomas Müller in Saturday's 1-0 win over Bayer 04 Leverkusen. The Bayern forward came close enough - hitting the post in the second half - but the 25-year-old says there are more important things in life than scoring. "That's not why I became a footballer, to go home having scored every weekend - it's about taking three points with you," he said in a post-match interview at the Allianz Arena. 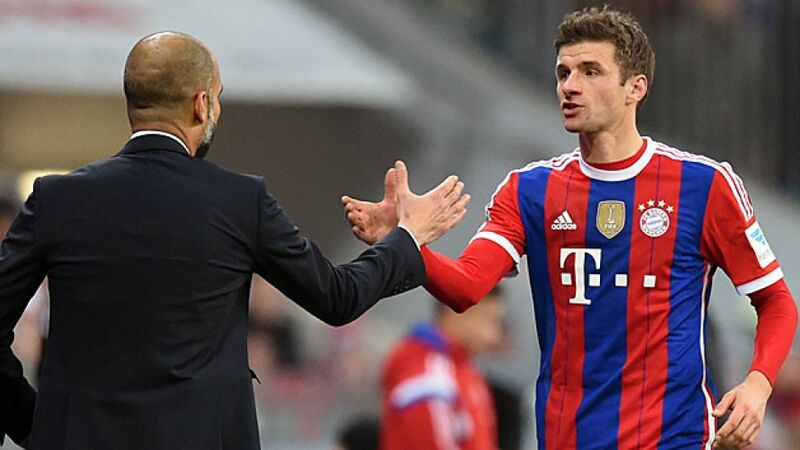 Question: Thomas Müller, this win has increased your advantage over another of your rivals. Only VfL Wolfsburg currently seem to be still in the hunt, but they are seven points behind. Can Bayern still be dethroned? Thomas Müller: It was a very important win, particularly when you consider that Leverkusen are one of the most consistent performers of the sides up at the top and they have a lot of potential. It was a decisive step for us, even if it is still early days in the season. If we carry on like this, all eyes are going to be on our first Bundesliga game of 2015 [at Wolfsburg]. Müller: Of course the coach considers his options before every game we play, particularly against Leverkusen since they have a particular style of play. We were well prepared for it, even if it wasn't easy. I was told to go wide and so too was Robert. In the second half, we then had Franck Ribery on the left. We'd hatched a plan beforehand and we stuck to it. It's hard to say whether it was a 4-4-2 or a 4-3-3, it was a bit of a mix. Question: What was the thinking behind this approach? Müller: We wanted to ensure their full-backs were forced to defend because we were there. Leverkusen realised after about five to ten minutes that they couldn’t get their full-backs so far up the field, but at the same time it meant we didn't have as much room either and our centre backs were practically the only players with any freedom. It wasn't the most exciting of games for us forwards and we had to be patient, but we hardly conceded any chances against a very strong attacking team and we're pleased with that. Question: This win against Leverkusen was the second narrow 1-0 win in a row after you beat Hertha Berlin by the same scoreline. In games like these, is it all about getting the three points? Müller: The other teams don't want to lose and they always give everything. They also have 11 men on the field who above all can defend well. I'm not bothered that we only won 1-0. We could have scored one or two more against Leverkusen. Müller: I didn’t become a footballer because I want to go home having scored a goal every week, but because I want to win three points. As long as we keep a clean sheet at the back and stay as we are with only three goals conceded all season, then everything's fantastic. Question: You now have your last group game in the UEFA Champions League against PFC CSKA Moskva on Wednesday. What's the aim in that game, considering you've already qualified for the last 16? Müller: For the club, it's still about getting more prize-money while for us it's about our record. We want to put in another good performance in front of our fans at home and they will want some top-drawer entertainment, and that's what we're here for. Question: Next Saturday, you travel to surprise third-placed FC Augsburg in the Bundesliga. How do you see that top-of-the-table clash? Müller: It's going to be a difficult game, like it always is in Augsburg. It's always been tight there in recent years and we know how things are, and we will be ready.